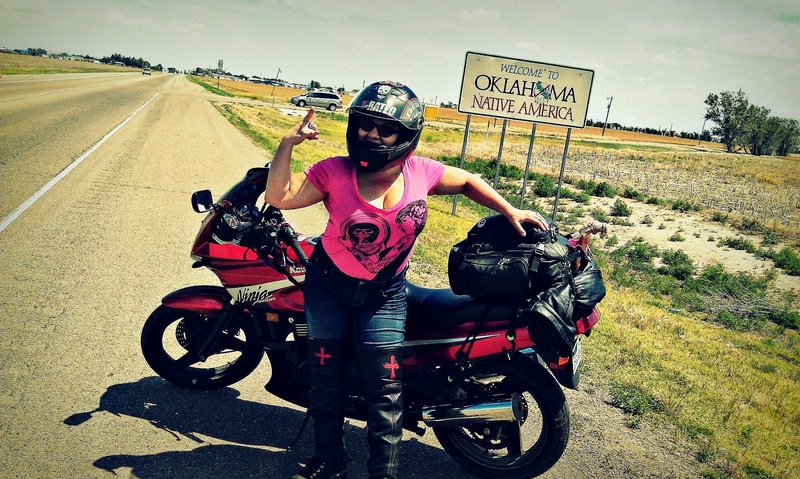 According to Lissa Hill, owner and creator of Lissa Hill Leather, "I have found that women riders, in particular, struggle to find jackets that fit, cover the waistline, do not fill with air, protect you from the elements, look fabulous, are made in North America, and do not have a “biker” look." She has promised to address these issues and make a not just jackets, but a number of products women will love. Hearing this, I was excited to order her Custom Half Chaps and Patented Vest Bag. Let's just start with the fact that the fit was extraordinary. I sent Lissa my measurements and she created her Custom Half Chaps for me. When they arrived and I zipped them on, I almost hit the floor with shock. I'm not easy to fit, being 4'11" and a size 12, so for something to zip up beautifully the first time amazed me. Usually I need 3 or 4 fittings for a good fit. But this was different. The chaps stand on their own around my calf, hugging the curves in all the right places. The supple leather, detailed stitching and great craftsmanship made them all the more delicious to wear and feel, as well as admire. They are incredibly warm too! I've worn other chaps that don't fit as well so they allow a great deal of heat to escape the body. I have issues with my knees when they are cold, especially while riding, but not anymore. With these Half Chaps my knees are cozy, warm and safe. Getting off the motorcycle is so much easier when my knees still work after 250 miles! Then there is the durability vs. style issue. Ladies have the toughest time finding items that look great and still give adequate protection on the motorcycle. But Lissa has promised her customers that she has addressed this and I wasn't disappointed. After riding a few days through some rough terrain, I thought the ride through the plains of the Midwest would be a breeze. Boy was I wrong. Hitting rough 70 mph winds and blowing dust seemed to have zero impact on my chaps. They kept me clean, safe and warm throughout the ride. While riding through Oklahoma we hit a swarm of grasshoppers. For less than a minute we were pelted by the little suckers, but as anyone who rides knows, riding through something like that can be painful as well as ugly. My Half Chaps protected my calves and softened the blows significantly, even though they took the brunt of the little monsters. When we arrived at our motel a soft wet cloth was all I needed to wipe them down, bringing my chaps to brand new condition once again. Lissa Hill Leathers are truly custom made, meaning your leathers are made for you based on your measurements and requirements and fit to your body in a four step process. I also received Lissa's new Patented Vest Bag. The fit, again, was extraordinary and customizable with laces on the sides. Made from the same durable, supple leather, beautifully lined with her signature red, breathable, comfortable jersey lining. The vest is more than a vest, but a versatile bag as well. It can be worn four ways to meet any biker chick's needs. I love wearing it as a vest, but I love that it can be a handbag as well. The outer pockets are sizable enough to be useful without looking bulky. The inner pockets are hidden and perfect for a couple of credit cards or keys. Made at the same high caliber of the chaps, I feel I've hit the jackpot with the products I ordered. A biker chick couldn't ask for better!